The partial government shutdown is taking its toll on furloughed employees and those who are forced to work without pay at Bradley International Airport. Fast-food executive Andrew Puzder withdrew his nomination to head the Labor Department on Wednesday as his support on Capitol Hill faltered. 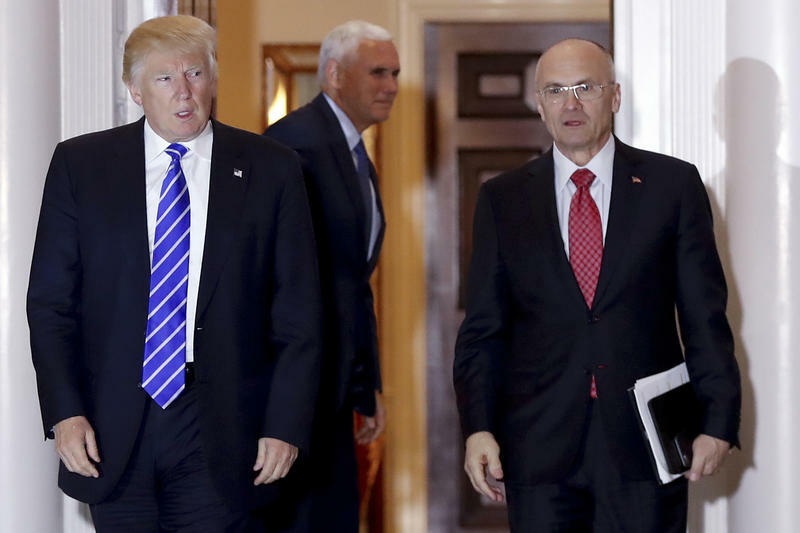 Facing criticism from both sides of the aisle, Puzder became the first Trump Cabinet pick whose nomination failed. The confirmation hearing for President Donald Trump’s labor secretary nominee has been postponed for the third time. Andrew Puzder now won’t go before the U.S. Senate until February 7. Workers in Hartford are among those protesting Puzder’s nomination. The state’s latest employment numbers sound a warning note for growth, with the state's largest business organization calling them "bitterly disappointing." But experts at the Department of Labor still believe the state’s fundamentals are still improving. Technical high schools used to be thought of as places where kids go to learn a vocation -- things that usually involve manual labor, like HVAC work, or car mechanics. Should Connecticut require paid family and medical leave? The state Department of Labor will report back to lawmakers this legislative session on how the state could implement the proposed law. Of the 95 people being laid off from the Department of Labor because of funding cuts, only one is a manager. Officials from the Malloy administration faced questioning from lawmakers on the issue Monday. The state's unemployment rate has fallen to 5.4 percent, according to the Department of Labor. The department's Bureau of Labor Statistics said Thursday the state added 4,100 jobs in July. Connecticut labor officials have shut nearly two dozen nail salons, recovered more than $47,000 in wages allegedly owed to employees and penalized businesses $100,000 for alleged pay and records violations. The Connecticut state Department of Labor is expecting to issue layoff notices to dozens of its employees as the result of cuts in federal funding. Connecticut lawmakers are considering a bill that would allow the state's health insurance marketplace, Access Health CT, to negotiate prices with the insurance companies selling products through the exchange. Senate Majority Leader Martin Looney, says the legislation could lead to lower prices for Connecticut consumers. People currently collecting unemployment benefits in Connecticut won’t be impacted by the federal shutdown. Also, federal employees who are out of work can apply for benefits. The Connecticut Department of Labor says economic recovery is taking longer than expected because of the lingering effects of a balance sheet recession – the most severe of its kind. Sectors saw steep reductions in their networth and consumers are still paying off personal debt. It’s a delicate environment where any negative trends could tip the apple cart, say economists at a panel discussion at the Labor Department. WNPR’s Sujata Srinivasan reports. The state unemployment rate dropped for the second month in a row in December. But the numbers have been volatile with intermittent highs and lows that sometimes don’t seem to add up. WNPR’s Sujata Srinivasan takes a look at why short-term figures may not always show the long-term picture. The National Labor Relations Board is expected to issue a decision soon that could affect graduate teaching assistants and researchers at private colleges and universities in Connecticut, and nationwide. The question boils down to this: are graduate students who work as teaching assistants and researchers, employees or students? It’s time for additional hiring in some industries, as we head into the holiday season. WNPR’s Sujata Srinivasan reports on the outlook for seasonal employment this year. Connecticut retailers are cautiously optimistic at what could be a promising holiday season. A key indicator, the Consumer Confidence Index measured by the Conference Board rose nine points this September, rebounding to levels seen earlier in February. Timothy Phelan is president of the Connecticut Retail Merchants Association. Amid all the many tax changes taking place in Connecticut right now, more than 70,000 businesses are receiving a special bill from the state Department of Labor. The cash will go toward paying interest on federal loans that the state has taken out in order to keep paying unemployment benefits. WNPR’s Harriet Jones reports. Mark Richards runs an IT consulting and recruitment company in Shelton, and he employs 25 people. He’s already grappling with changing his payroll to impose a higher income tax on many of his employees.